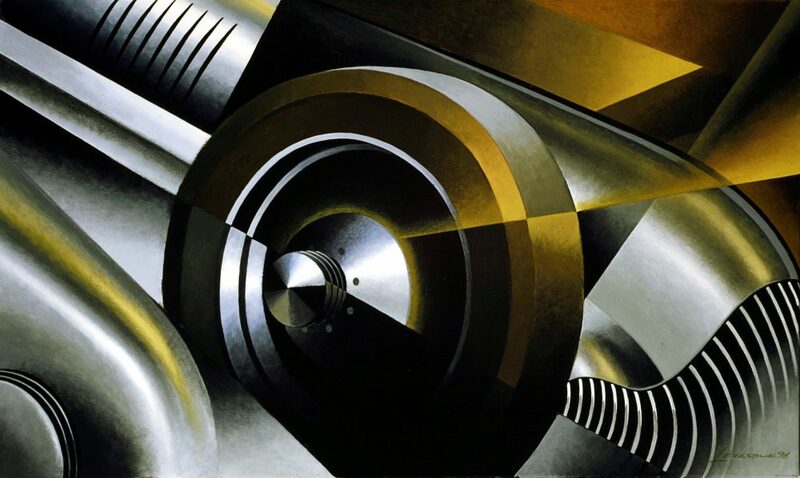 Ever since the 20th century, when the car was hesitantly (at first) welcomed into the art world (take a look at brutal and dynamic shapes of the futuristic movement, which saw cars as a vital part of the new society), it became an alluring piece of subject matter. Among the most respected artists who’d turned their back on conventional art subjects—like Mother Nature or other commonly accepted “beautiful” things—Alain Lévesque’s contribution is outstanding. 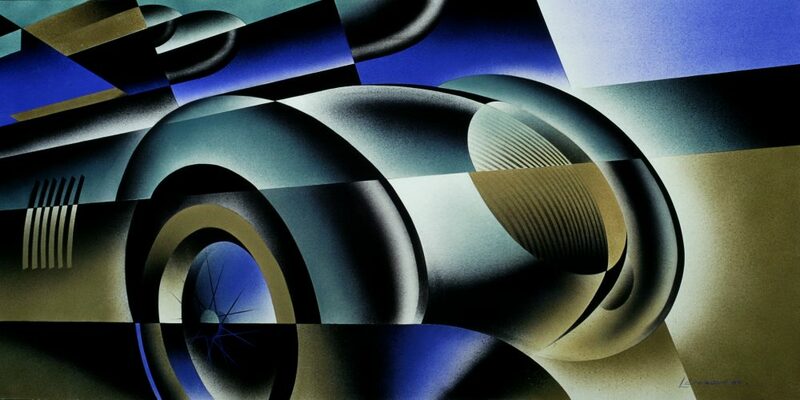 His paintings preserve the quality of the cars he selects, and they are presented in striking arrays of color and geometry without adding too many additional layers to obscure the machines at their center. 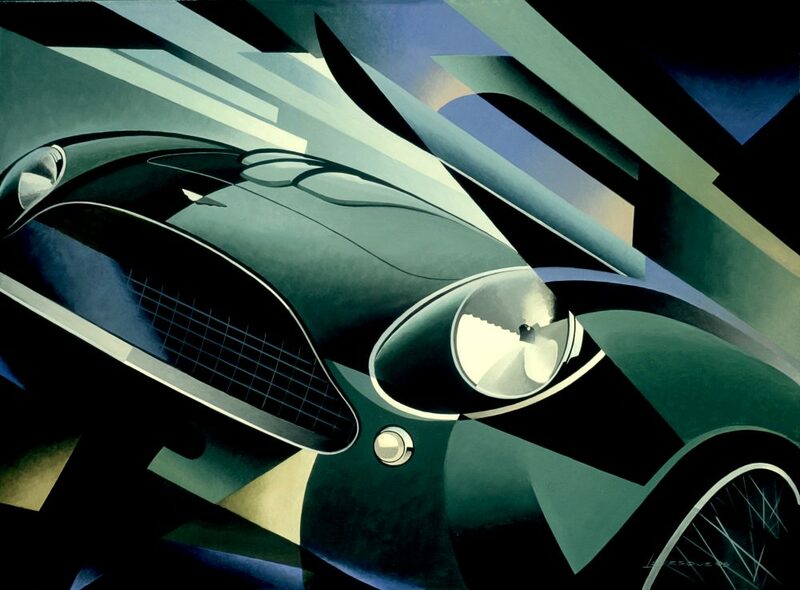 His work is retro yet fresh, powerful, arresting, and his paintings exude a very particular atmosphere. I recently had the chance to speak with the French-Canadian artist to gain some insight into his creative process and what inspires him to paint. 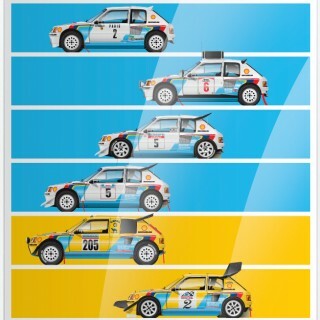 Monika Repcyte: Alain, let’s start with the basics; what is your very first car-related memory? 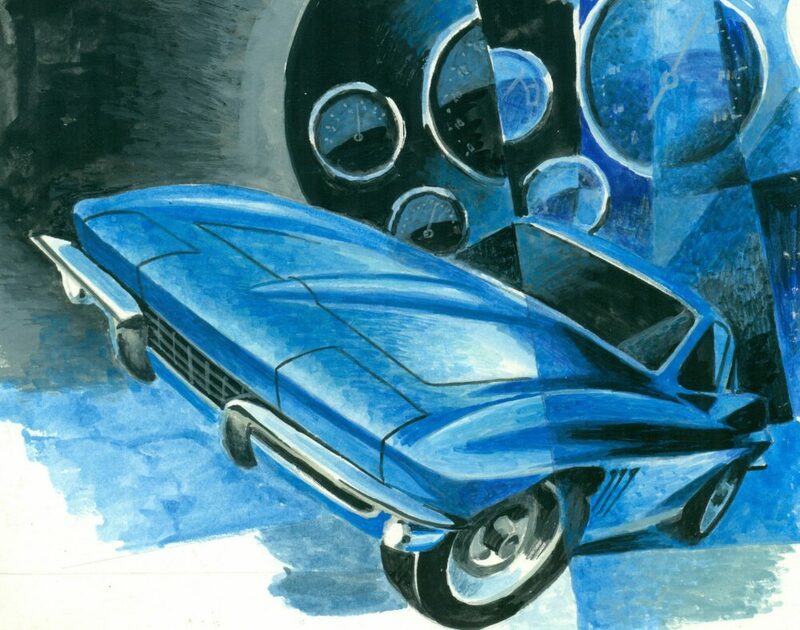 Alain Lévesque: The most remarkable car-related memory from my childhood is one specific day in 1967, when I saw my father behind the steering wheel of a new Buick Riviera. When I saw its retractable lights, windshield wiper, and the antenna, I was absolutely certain that this car in a sumptuous white coat had secret weapons hidden inside of it. These were the times when Batman made his first appearance on the TV, and I was always waiting impatiently for the episodes where he would jump into his own Batmobile. 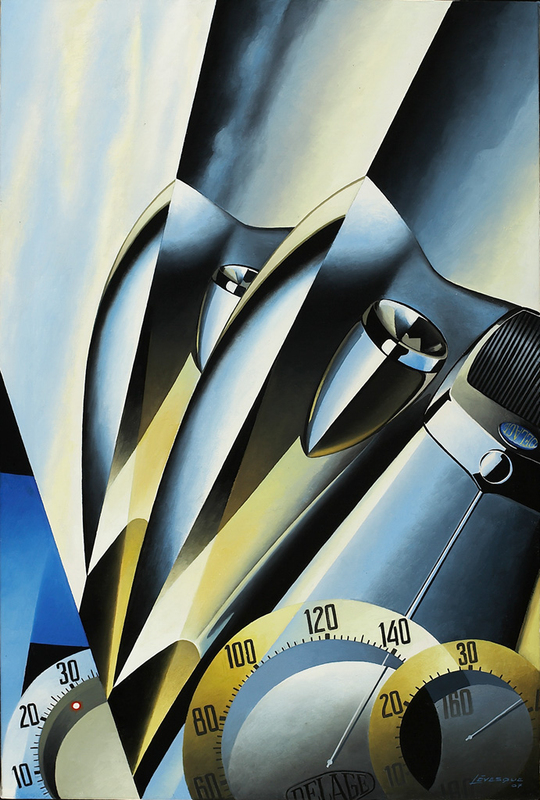 MR: When I first came across your works, I thought that references to the ‘30s futurism movement were instantly recognizable. Nevertheless, you also cite the Art Déco movement among your inspirations, and different artistic expressions in general seem to be important to you. 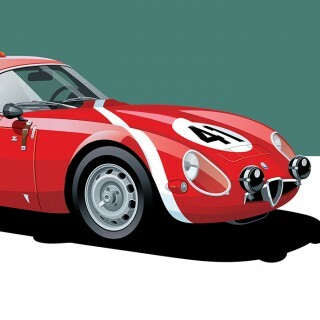 When you started drawing your first pictures, were you more encouraged by fascination for these particular artistic movements or rather motivated by love for the cars themselves? AL: Well, my fascination with cars was apparent even before I started going to school. 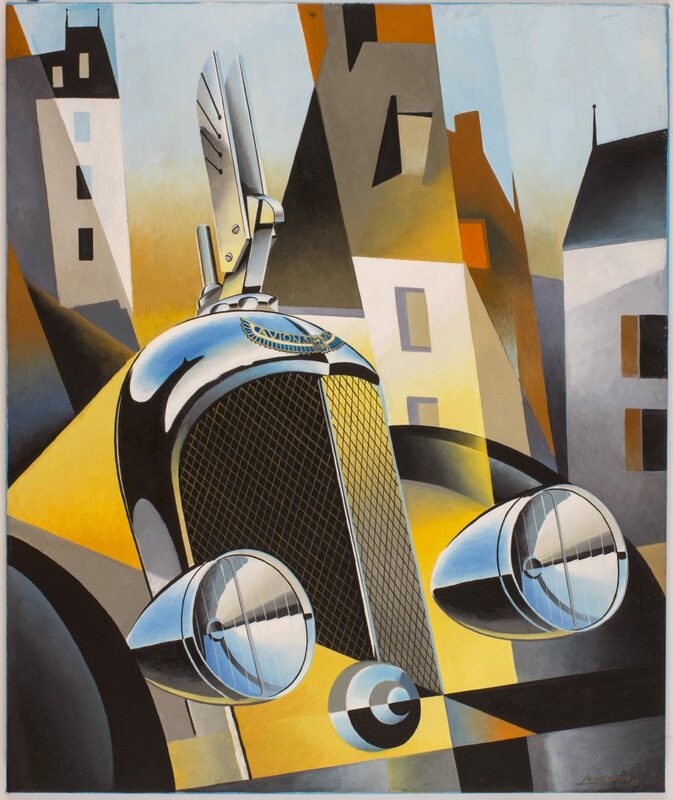 I noticed that my parents had emphasized interests in automobiles and even without understanding it consciously, I developed visual codes oriented towards cars. 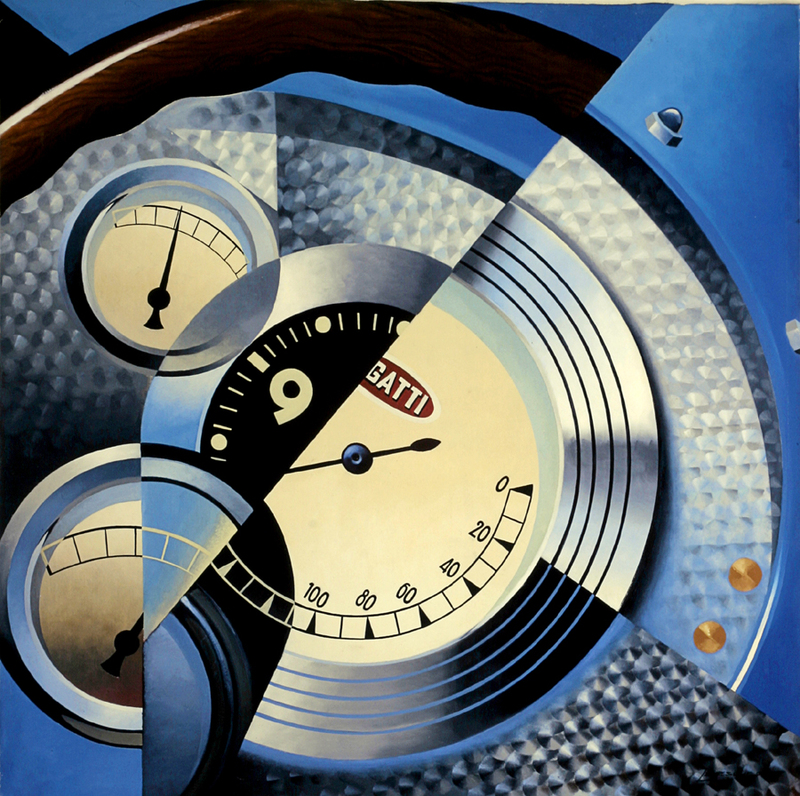 When I learnt that some sort of parallel in art world existed, named “Art Automobile” (and that there were even are special galleries in London, Paris, and New York, which were dedicated to this new branch of modern art), I was under the impression that the history of modern art welcomed cars as an essential part of popular culture. 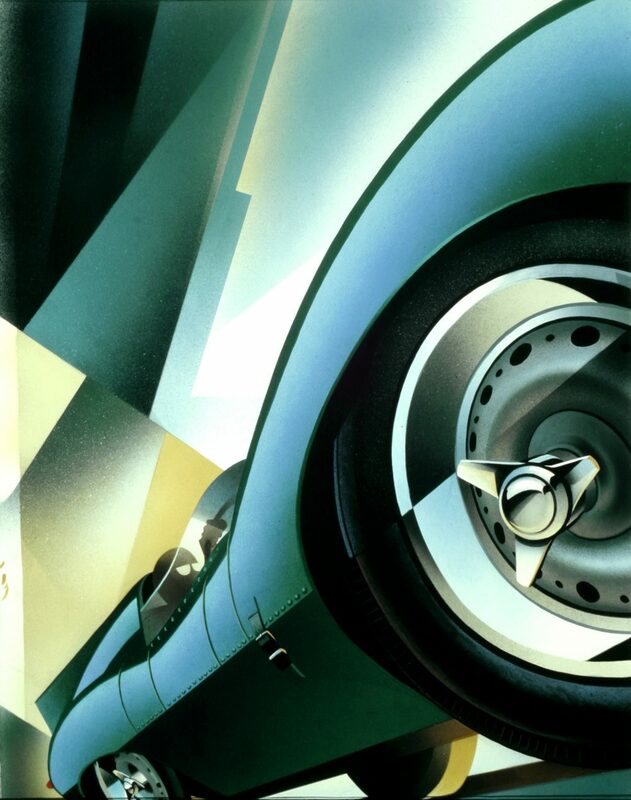 Thirty years after my initial decision, it seems that my career was guided by destiny, because the public fascination for automobiles never really declined from that point onward. Talking about art movements, my graphic art studies in Montreal allowed me to stick clearly defined terms on artistic movements, which had already marked my creative work by then. 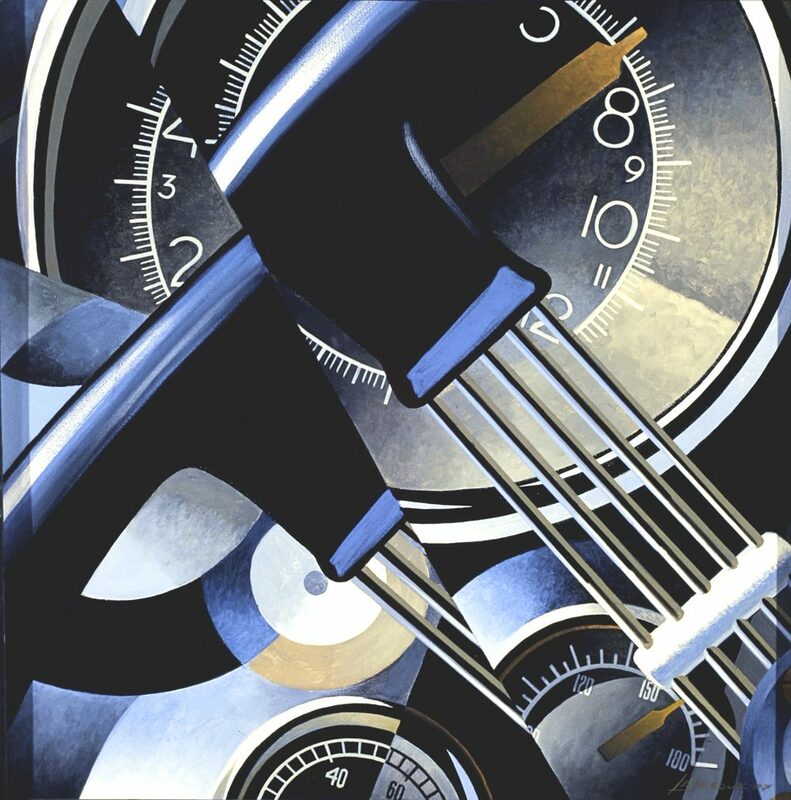 Italian futurism, cubism and Russian constructivism all contributed to forging my creative identity and they helped to develop my own style. These so-called avant-garde movements offered me freedom of expression; I could cast aside immaculate precision in favor of expressing myself properly. During this period, I realized my very first piece of work, which integrated the ideology underpinning all of these avant-garde art directions. Such style quickly became my signature. MR: In your opinion, what was the defining moment of your artistic career? AL: I think that one of the most important moments, which allowed me to excel in this profession, was a phone call to a gallery director in New York. He was featured in a special report in Automobile magazine in 1989, and that’s where I first saw him. I have to admit that the director wasn’t too excited about the idea of me sending my portfolio over (he must have received tons of them every single day). Nevertheless, I persisted and sent some examples of my work. 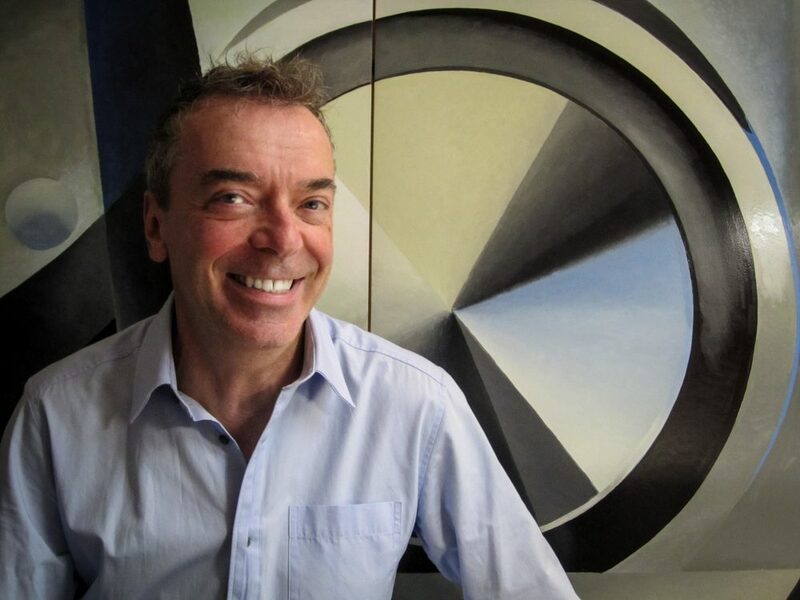 Thirty years later, I am still working with this gallery, L’art et l’automobile (which is now situated in Texas), and with its current director, Jacques Vaucher. MR: Can you tell us more about your painting process? AL: Sure. First, I prepare a series of sketches by crayon, which is followed by several studies realized in gouache paint. When the final result seems satisfying, I print a paper version on the original size of the canvas. The last stage is tracing final shapes with the paintbrush and completing different color schemes, which often differ from those used in the gouache stage. 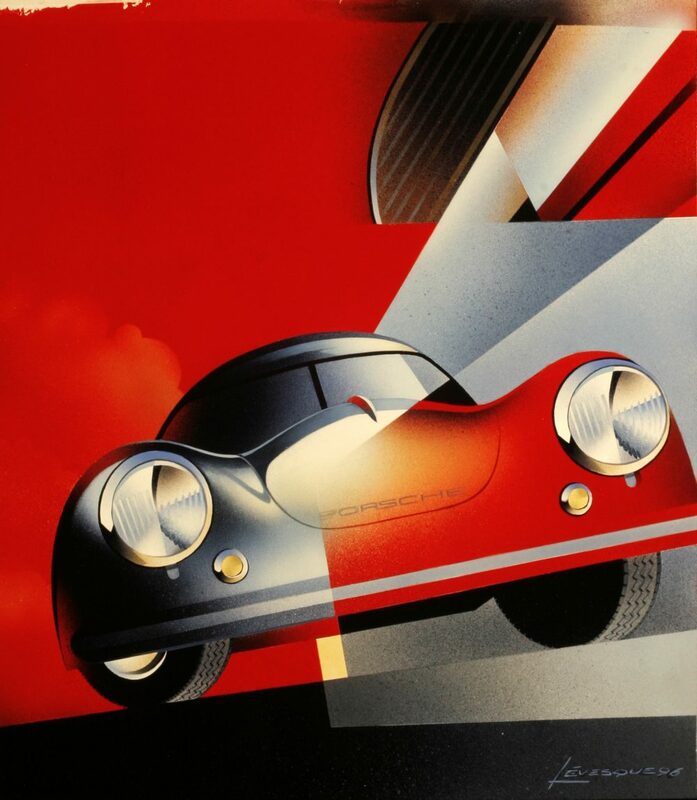 MR: You have collaborated with prestigious car brands (Porsche, to cite at least one) and contributed to events of major importance (for example, creation of The Elegance Contest posters in New York). I am sure you have many other memorable projects under your belt, can you share some with us? 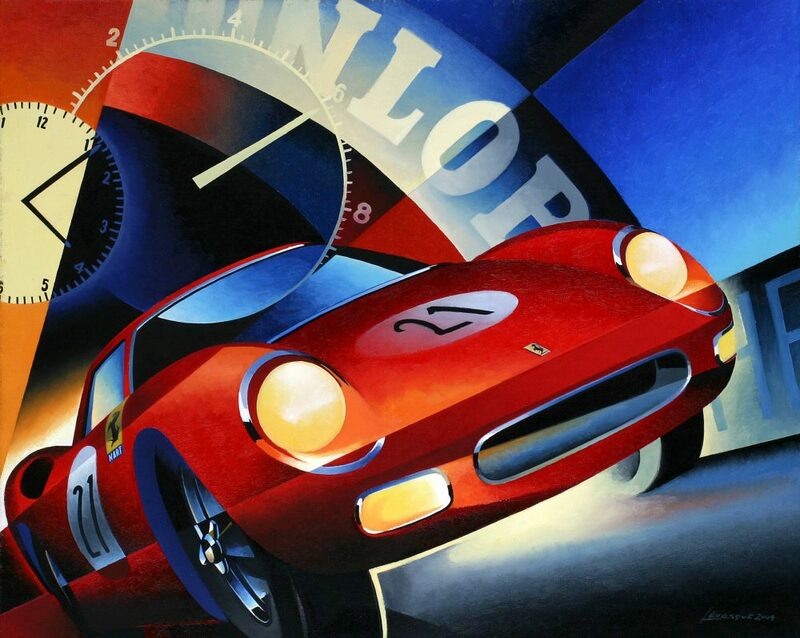 AL: My collaboration with the Barrett-Jackson auction company (creating posters and catalogues for them) opened many doors for me, especially in communicating with new types of collectors. 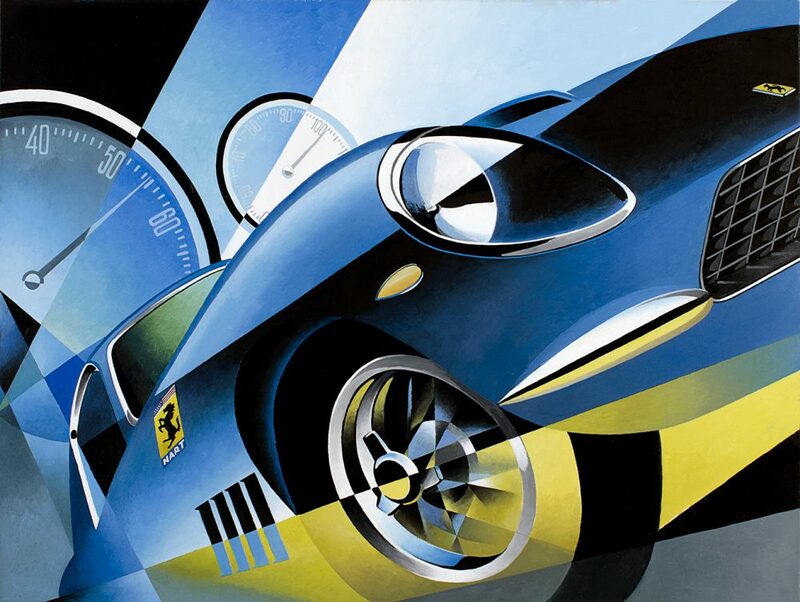 My experience with Porsche in Stuttgart as part of its 50th birthday in 1998 was also exceptional because it led to my works being more widely recognized in Europe. More recently, a special report was published in the Italian edition of Top Gear, and I had a cover page dedicated to my work in the Porsche magazine Panorama. MR: What kind of memories do you keep from all these projects? What are the main requirements for an artist like you? AL: You know, there’s one very acute sentiment that stays with me long after the projects are done: beyond the strong passion for cars, people whom I work with (and whom I work for) are very curious to find out the origin of my vision. Having a possibility to participate in creative exchanges with such people enriches my work and my expression. The main requirement for me is to preserve my signature style and not deviate. MR: Is there a common denominator, which characterizes all the cars in your creative repertoire? How do you choose them? Talking about concrete models, all of my favorite ones had reached my imagination quite naturally, with the help of pop culture. 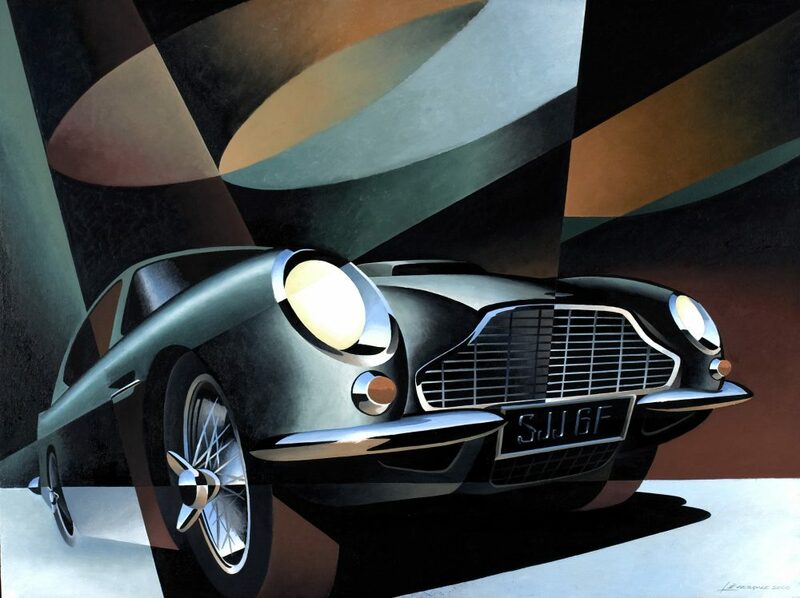 Thanks to James Bond, I discovered the fantastic Aston Martin. I re-appropriated and reinterpreted it many times. I would also cite Jaguars among my favorite subjects. In addition, American cinema of the ‘60s was an impressive demonstration of muscle cars—Ford Mustangs, Dodge Chargers, and Chevrolet Camaros were like friends, which I hoped to meet personally. MR: Have you ever received skeptical remarks about the subject of your work? 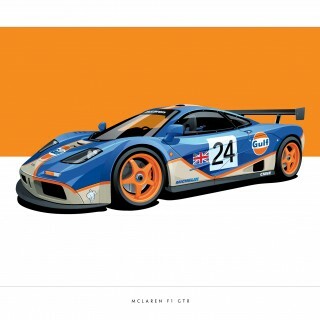 AL: Generally speaking, yes, there have ben times when I had to explain why I choose to paint cars as the main subject. As you know, the comprehension of what is supposed to be a proper “artwork” varies greatly depending on our experience in art and in our personal sentiments. I had discussions with people who were deeply persuaded that only nature’s beauty is worth being represented. These were the occasions when I tried to show that beauty could reside in completely abstract things (that’s what modern art history teaches, too!). I also remember certain times when I had to explain my creative approach. 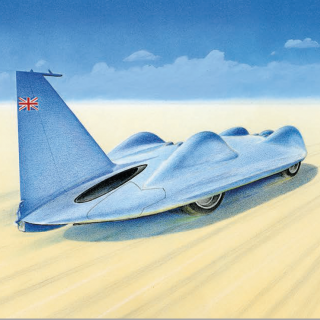 For example, I represented a Porsche model divided in several planes in the futurist vein, which was at odds with its owners’ vision. He reacted quite sensitively, but after I explained the historical aspect of this representation, he thanked me for opening new perspectives and helping decode other works conceived in a similar way. MR: And who are your clients, typically? AL: My clientele is principally comprised of style, architecture, and design connoisseurs. They are not all going crazy at the sight of cars… I have a client in Germany whose family has been fabricating glass objects for six generations, for example. He brought me a project to create several works that could highlight the least exploited characteristics of certain car models. For reference, he gave me photographs from his impressive car collection. 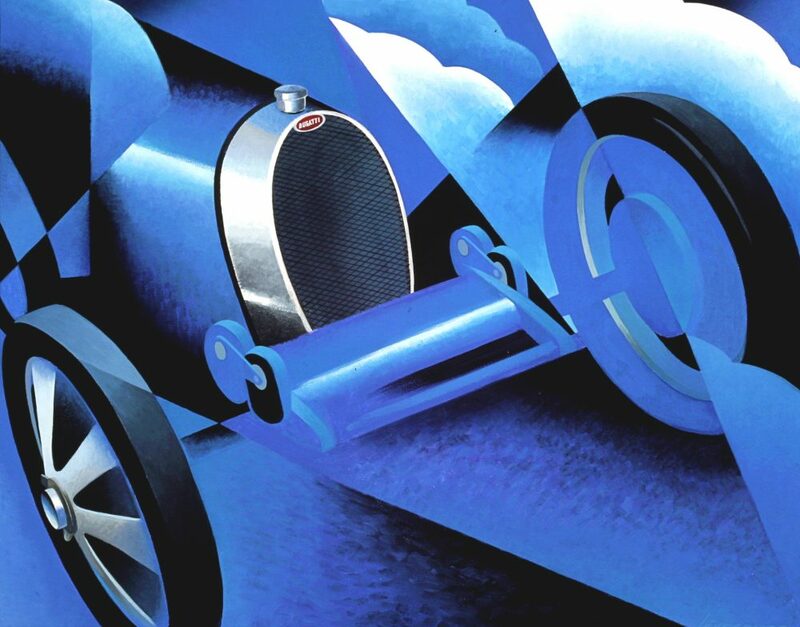 One example could be a drawing of his Bugatti Atalante—in this work I adopted an equestrian theme in the background to emphasize the origins of the brand. MR: So you cited muscle cars as friends of yours too—what is the story of your Pontiac Firebird? AL: As I was so intensely attracted to the ‘60s aesthetics, in John DeLorean I saw an engineer who was capable of breathing a new energy into the works of Bill Mitchell. The arrival of Pontiac GTO in 1964 and the rapid surge of audacious designs related to high levels of performance made a whole new generational dream. In this sense, buying a Firebird was a great decision. I feel that I now possess an undeniable icon from this exceptional period of American design. MR: What are you working on at the moment? I stumbled upon a masterful Levesque Auto Union tucked away in one of the many stairways of the famed Fairmont Chateau Montebello. 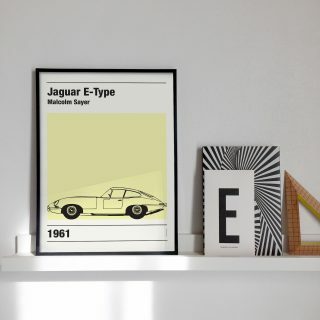 A poster of the Auto Union ? Yes please. 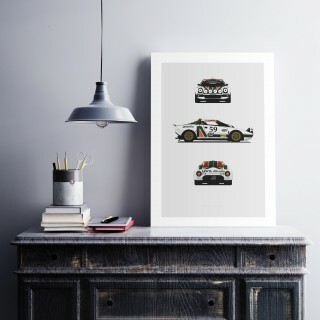 I’d love to see some quality prints priced for fiscal mortals in the Petrolicious Shop. HINT, HINT. Great read. I have one of his signed and numbered prints outside my office, bought it in a gallery in Montreal 18 years ago. I thought it was a lot of money at the time but my girlfriend convinced me that I should buy it if I like it. Still have the print, still have the girl!